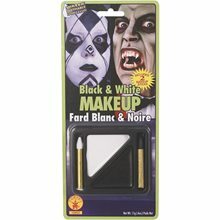 Black and White Makeup Kit.Includes: One black and white makeup tray, white makeup stick and black makeup stick. *Costume and Accessories Not Included. Sold Separately.Black and White Makeup Kit contains two Color Palette And two sticks. It is water Washable. Grim Reaper Adult Mask.Includes: One Grim Reaper Adult Mask. Available Size: One Size Fits Most Adults. *Costume and Accessories Not Included. Sold Separately. Take the best moving mouth skull mask, add a rotting hood and a few special touches, and you have this Grim Reaper mask. This is one great monster mask. This Halloween mask can be the beginning of a very scary Halloween costume. 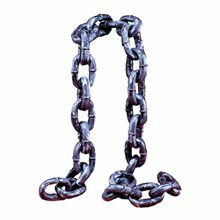 Minister Darkness Black Men Costume,Wear this Evil looking costume with a mask or make-up! This is just a Cool and Sinister Costume!Rule over the night in this crushed Velvet and Poly robe With Woven Ribbon Trim Say your prayers that this Minister of Darkness will become a distant memory! 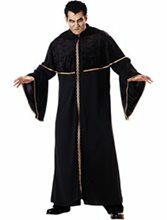 Minister of Darkness costume features a black robe with attached crushed velvet capelet with gold trim.